Update: this was, in fact, released last year (though it's still available). I meant to write about this Teeling single cask, single malt. 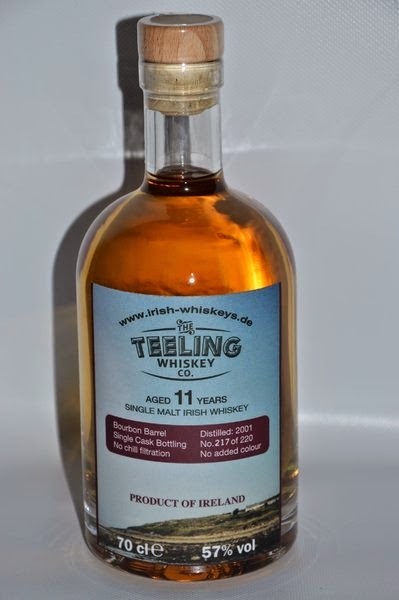 A new Teeling whiskey has surfaced in Germany last year. It's a single cask, double-distilled, single malt bottled exclusively for Irish-Whiskeys.de, an online seller of Irish whiskey based near Frankfurt. Distilled in August 2001, it matured in a bourbon cask for almost 12 years, until July 2013. It is bottled at the cask strength of 57%. It is neither chill-filtered nor coloured. Vanilla, peach, apricot, grass, oak. Oily, intense fruit, sweet vanilla, oak, subtle hints of pepper. It sells for a very reasonable €65 and can be shipped to Austria, Belgium, Germany, Denmark, France, Italy, Netherlands, Poland and Spain. The Irish Whiskeys company was founded by Mareike Spitzer in September 2011 when she found it hard to find a good selection of Irish whiskeys in Germany. I asked Mareike when her interest in whiskey began. She tells me her husband was quite the fan which piqued her curiosity so, at a whiskey show in Frankfurt in 2008, she sought out something mild and sweet. She found it in Jameson Gold which, to this day, remains one of her favourites (it's one of mine too!). Mareike toured Ireland recently, meeting with distillers old and new like Slane Castle, Cooley, Teeling, Bushmills and Glendalough. While here she enjoyed some of the best spirits this island has to offer, including Teeling's 26- and 30-year old single malts, and 15-year old cask strength, sherry-matured Bushmills malt. Irish-Whiskeys.de is an online-only vendor but you can meet them in person at various whiskey shows this year: Whisky Herbst in Berlin, Whiskymesse Rüsselsheim, Aquavitae in Mülheim and Whisky & Tobacco Days in Hofheim. Their catalogue is pretty comprehensive and up-to-date. I spy some other exclusive bottlings, some whiskeys that aren't available in Ireland, and some labels I don't even recognise. It's already a great selection but Mareike aims to keep expanding it and to add more single cask bottlings, in particular. There will be another of these soon, perhaps by the end of this month.